Follow twitter.com/FutureHeartDay for Bonnaroo updates and music news. Check out Psych Explorations of the Future Heart’s Bonnaroo 2010 photo and tweet recap here, a fan-voted webcast poll here, and video rewinds here, here and here. See Your Favorite Bands at Bonnaroo with SPIN! :”If you aren’t heading to Bonnaroo, don’t fret: You can watch the interviews on SPIN.com, the day after they happen in Tennessee. Get the interview schedule below. Associated Press (via boston.com): “Nearly 100 acts… will be spread out over a multitude of stages and tents on the Tennessee farm owned by Superfly Productions and AC Entertainment, the organizers of Bonnaroo. More than 70,000 fans are expected to attend the festival, which runs through Sunday. But perhaps as many, or more, will watch … at YouTube.com/bonnaroo. Thousands more might listen to the Dave Matthews Band, the Flaming Lips and others at NPR.org/music. And still more may catch up watching “Live From Bonnaroo 2010” on Fuse on June 17. Why they matter: Fireworks. Psychedelic stage sets. 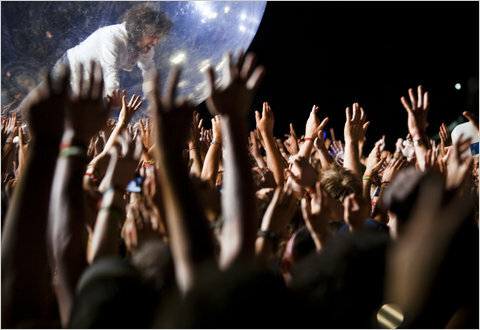 Singer Wayne Coyne surfing the audience in a giant bubble. These are just a few reasons why this outfit is the go-to festival headliner. Oh, and the tunes are amazing, too — just check out their dark, experimental, SPIN-approved new double album Embryonic. The Flaming Lips and Stardeath and White Dwarfs at Bonnaroo, 6/11/10, nashvillecream.com, June 14, 2010 at 2:03 PM: “As always the band balanced out their abrasive assault of psychedelics with more good vibes than a Beach Boys song courtesy of Coyne — The Raffi of rock showmen — and his optimistic calls to affirm life at every opportunity. Unfortunately, his message was no match for the wandering mind of one person in our party who, as the band began their take on Floyd’s Dark Side, went to a dark side all his own and started whispering morbid non sequiturs to strangers before fleeing the crowd in a panic, forcing us to follow and use our third eye to guide him out to more manageable territories — which was utterly impossible considering that Centeroo at 1 a.m. is a terrifying mélange of moving bodies, flashing lights, clashing sounds and muddy puke-laden sinkholes that’s disorienting by design. Jay-Z, Stevie Wonder, Kings Of Leon Beat The Heat At Bonnaroo, mtv.com, June 14, 2010, 12:19 PM EDT: “There was mud, rain, oppressive heat, a set by a world-beating rap superstar (Jay-Z), a classic soul icon (Stevie Wonder), a former “Tonight Show” host (Conan O’Brien) and a jam-band legend (Dave Matthews Band). In other words, just another action-packed weekend at the ninth-annual Bonnaroo Music and Arts Festival. From Thursday through Sunday, more than 75,000 fans tried to escape triple-digit temperatures by tuning in to ferocious sets from Jay, a midnight mindfunk from the Flaming Lips, anthemic rock from kind-of hometown boys Kings of Leon and just about every flavor in between. For Friday night’s headliners, Nashville-bred Kings of Leon, the gig was somewhat of a homecoming. Their latest tour is both a victory lap for their 2008 breakthrough album, Only by the Night, and a preview of their next album. They were preceded by the moody rock of the National and the ‘Roo debut of the Carolina Chocolate Drops, who perked up plenty of ears with their bluegrass twang and harmonies. One of the most highly anticipated acts of the festival, the Flaming Lips, didn’t disappoint as they played one of their usual confetti and prop-filled sets and then covered Pink Floyd’s Dark Side of the Moon with Stardeath and the White Dwarfs. The intermission allowed some fans to wander over to check out some of grungy blues from duo the Black Keys. After two days of sweltering heat, a light rain glossed the crowd giving everyone a must needed cool-down at during the Avett Brothers’ show. Even though the Thievery Corporation faced tough competition, sharing a timeslot with Jay-Z, a large, dedicated crowd danced away to the veteran group’s world-music-influenced techno. After Saturday’s hectic schedule, Sunday provided a mellow closing to the festival. One Dead, More Than 100 Arrested At Bonnaroo: 29-year-old David Sloan appeared to die from heat exhaustion., mtv.com, June 14, 2010, 10:11 AM EDT: “A 29-year-old man, North Carolina’s David Sloan, died on Sunday (June 13) after falling ill at the Bonnaroo festival in Manchester, Tennessee. According to the Tullahoma News and Guardian, officials believe that Sloan was overcome by heat, which caused him to collapse early Sunday morning in front of medical personnel after his core body temperature reached 108 degrees. Sloane was rushed to an area hospital, where he later died. The Tennessean reported that, with temperatures in the low to mid-90s and a heat index over 100 degrees for much of the weekend, air-conditioned medical tents were treating about 25 percent more concertgoers than in years past. As of noon on Saturday, more than two dozen fans had been transported to area hospitals for heat-related emergencies or other injuries that couldn’t be treated on site. The festival, which featured sets from Jay-Z, the Dave Matthews Band, Stevie Wonder, Conan O’Brien, the Flaming Lips, Kings of Leon, Weezer and Kid Cudi — who jetted to the site just hours after his arrest for criminal mischief and possession of a controlled substance — also saw a fairly typical number of arrests. Today and Yesterday Sing Harmony at Bonnaroo, nytimes.com (“a version of this article appeared in print on June 14, 2010, on page C1 of the New York edition”), June 13, 2010: “The aspirations and survival tactics of the Bonnaroo Music & Arts Festival, the annual four-day marathon of musical overload and muddy shoes, were neatly summed up in its headliners this year: a jam band, current hitmakers and a longtime pop giant. They balanced Bonnaroo’s neo-hippie aura with attention to the present. The leading hippie among the performers may well have been Wayne Coyne of the Flaming Lips, who followed Kings of Leon on Friday night with a nutty, eye-popping video and stage spectacle, playing their own anthemic songs followed by a boisterous reworking of a full Pink Floyd album from 1973, “The Dark Side of the Moon.” Mr. Wonder called for peace and love; Mr. Coyne called for peace, love and legalizing marijuana. Bonnaroo’s setup, on 650 acres owned by the festival’s promoters, pays tribute to hippie nostalgia, with a rainbow-shaped entrance gate and tall bobble-head statues of figures like Jerry Garcia. Exhibits and recycling stations strive to instill environmental virtue (which can’t make up for the actual impact of vehicles and trash from the festival). The audience at Bonnaroo is famously participatory, usually ready to dance, sing, shout or clap along with the slightest encouragement (or none at all). Yet where earlier festivals were full of loose-limbed, noodle-dancing jam-band fans, recent ones have been more mixed, particularly this year. The jam-band twirlers and flailers are now joined by hip-hop and frat-party-style dancers — arm-waving and finger-pointing, doing what might be called the “go ’head” motion — and, increasingly, by more aloof, hipster-style spectators. Jam bands cherish the spontaneity of the live moment, even though, paradoxically, their fans tend to be obsessive archivists. Meanwhile many hipsters make themselves digital documentarians first, intent on holding a video camera steady. Bonnaroo had music for them, too. A visible gray-haired contingent was part of the festival’s approximately 75,000 visitors. (Bonnaroo’s attendance is about the same size as the Coachella Valley Music and Arts Festival’s in California or the daily turnout at Lollapalooza in Chicago.) This year’s lineup here included musical patriarchs like John Prine, Kris Kristofferson, John Fogerty, Jeff Beck — whose guitar solos seared and sang — and Jimmy Cliff, whose voice is undiminished at 62. Bonnaroo has also become a noncoastal destination for comics; Conan O’Brien headlined the festival’s comedy tent and doubled as a main-stage master of ceremonies. Amid heat and humidity that turned the festival into a steambath occasionally punctuated by a downpour, Mr. O’Brien offered advice to hippies and hipsters alike. “Take a shower,” he urged. SLIDE SHOW: Kings of Leon, Flaming Lips, Dead Weather, Jay-Z and more light up Bonnaroo fest, soundcheck.ocregister.com, June 13, 2010, 3:39 pm: “Things here are just designed to be wacky. For example, the stages are humorously named This Tent, That Tent and the Other Tent, and then there’s Which Stage and What Stage (that’s the main stage, actually). Imagine how that plays out when attempting to direct a less-than-sober friend. 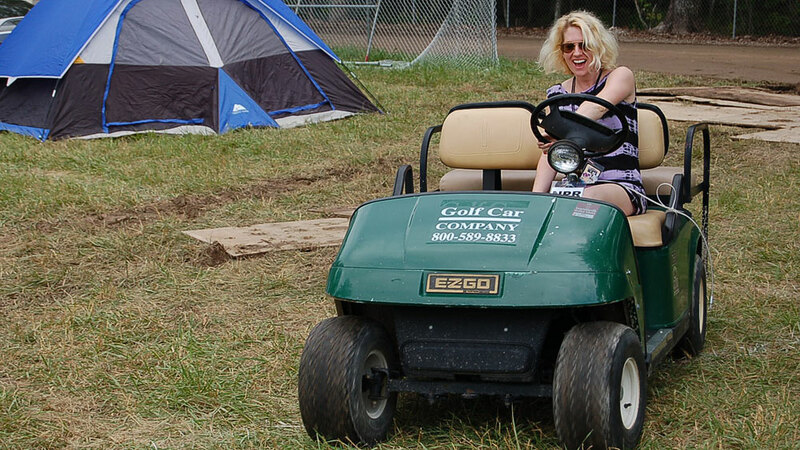 Plus, sets tend to go longer (up to three hours in some cases) and later (until about 5 a.m.) than at any other festival, making Bonnaroo as much a shared test of endurance as it is a supremely cathartic experience. For myself and other ‘Roo regulars, bands included, Bonnaroo is a second home — a place to forget about normal society and have loads of unencumbered fun with roughly 80,000 other music enthusiasts. The Kings certainly deserved their crowns Friday evening, but others would argue that the best performance belonged to Bonnaroo veterans the Flaming Lips, who delivered one set of typically confetti-engulfed original material, followed by a visually mind-blowing performance of Pink Floyd’s 1973 opus The Dark Side of the Moon, with assistance from Stardeath and White Dwarfs. With the Lips scheduled for the same midnight slot as the Black Keys, Bassnectar and this fest’s much-touted Daryl Hall/Chromeo collaboration, sacrifices were necessary — but I did manage to catch the tail-end of the soulful Ohio-based Keys, who for the first time since I began keeping track of them fleshed out their rhythm section with an extra bassist and keyboardist, the better to reproduce tracks from their new disc, Brothers. On The Ground At Bonnaroo: Friday, npr.org/blogs/allsongs, June 12, 2010, 4:57 PM: “With almost 24 hours of concerts under their hemp belts, Bob Boilen and the All Songs Considered Bonnaroo crew took a breather late Friday night and Saturday morning between The Flaming Lips‘ highly anticipated rundown of Dark Side of the Moon and LCD Soundsystem setting controls for the heart of the sun in the dead of night. Delirium was beginning to set in. “I’m at that point where I’m getting a little wacky,” Jill Riley of The Current said. Bob, Jill and Andy Uhler from KUT in Austin had just witnessed Wayne Coyne’s R-rated Pink Floyd interpretation. As always when it comes to Flaming Lips performances, there were lasers, animal costumes, smoke and lots of confetti — but it wasn’t quite as perfect as the album it paid tribute to. disheveled version of madness rather than Pink Floyd’s majestic one. Wayne Coyne, to stir up the crowd, claimed there was actual money inside some of the balloons released during “Money.” Who knows? Flaming Lips, Kings of Leon Ignite Bonnaroo 2010, rollingstone.com, June 12, 2010, 11:45 AM EDT: “There are a few hallmarks of summer music fests: the smell of thick mud baking in the sun, the sound of three different bands colliding and the sight of Wayne Coyne in a giant plastic bubble. That vision arrived at the start of a set that was ambitious, even by Flaming Lips standards, last night at Bonnaroo. An enormous orange arch took up the entire rear of the stage, and in its center a digital screen projected a series of bizarre, multicolor images — most of them involving naked women. Enormous cannons fired huge clouds of confetti into the sky during the rousing “Do You Realize?? ?” and Coyne donned massive prosthetic hands and used them to shoot green lasers up at a pair of planet-sized disco balls, which reflected the beams out above the crowd. During “See the Leaves,” the stage went blood red, Coyne twirling around in the center like a maniacal sorcerer. But special effects aside, the band worked hard to to incorporate the bleak psych numbers from their last record, Embryonic, alongside the sunnier material for which they’re known. Opening with the throbbing “The Ego’s Last Stand,” the group resisted the impulse to soften the tone, and the newer songs stood out like grim, magnificent ogres.The Lips were pulling double duty at Bonnaroo: In addition to performing their own material, they were also enlisted to play Pink Floyd’s Dark Side of the Moon in its entirety, assisted by fellow Oklahomans Stardeath and the White Dwarfs. The setup was tricky: a 15-minute intermission after the Lips’ proper set almost derailed momentum, but by the time the group hit the grinding center of their aggressive reimagining of “Breathe,” the audience was enraptured. “The Flaming Lips play for the best fans in the world, because you guys, you give us love,” Coyne cooed. The National have also figured out a way to operate between two worlds. Their records may be small, tense and quivering, but their set at Bonnaroo was explosive, a snapshot of a band on the brink of new success. Wisely abandoning their customary suits in deference to the Tennessee sun — vocalist Matt Berninger donned a vest only to remove it one song in — the National swelled up to stadium size, every song a lit fuse that smoldered slowly and then fully detonated. Flaming Lips Wow with ‘Dark Side’ at Bonnaroo! 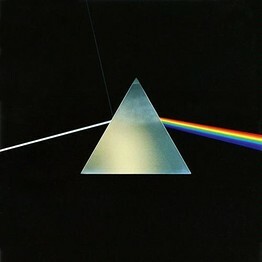 It Happened Last Night, spin.com, June 12, 2010 10:05 AM: “Their take on Dark Side of the Moon was gloriously shambolic, with walls of guitar buttressing the parts of Gilmour or Waters, accompanied by some combination of accented crooning from Coyne, Drozd, and Stardeath’s Dennis Coyne. Huge chords verging on metal fueled “On the Run,” which crashed hard into the broad sprawl of “Time,” which in turn became a huge psych-rock freak-out that was soon recognizable as “The Great Gig in the Sky,” with Drozd doing the gospel part fair justice. “Money” inspired a massive sing-along, as did “Us and Them,” which the band played from complete darkness while the combination of colorful lasers, excess fog, and 3D lyrics upped the trippy factor considerably. Bonnaroo 2010 – Friday Recap – Conan O’Brien, The Flaming Lips, Umphrey’s McGee, Kings of Leon, Tori Amos, The National, Michael Franti, Tenacious D, glidemagazine.com, June 12, 2010: “Friday at Bonnaroo 2010 was one of those special days when you felt the collective electricity of bands and audience surge through your body as soon as your feet hit the ground on site. Just up the road waited a top-shelf open bar of music with enough spirits to create a limitless array of personalized audio-visual cocktails, and no two people concoct the same blend. Every act I saw was above average or excellent. There was no “phoning it in,” though Tenacious D’s Jack Black did field a phone call on stage that eventually led to the firing of his partner Kyle Gass. First, though, Trombone Shorty and Orleans Avenue confronted the high noon sun with their supercharged blend of funk, rock, jazz and soul. Crowd favorites everywhere they go, the band crammed as much “Superfunkrock” into one hour as they could and challenged the crowd to keep up. One of the most anticipated shows in Bonnaroo history occurred just after midnight as The Flaming Lips unveiled a revamped stage show and planned a performance of Pink Floyd’s Dark Side of the Moon. The Which Stage field was crammed with glowing, gyrating revelers for the duration of the 2-plus hour show, which included a highly entertaining set of Lips material before an intermission. I think “The W.A.N.D.” is one of the greatest live moments in any band’s repertoire, and the band’s flashier stage setup turned the song’s intensity up even further. It was a nice mix of a few songs from Embryonic plus staples like ‘She Don’t Use Jelly” and “Yoshimi Battles the Pink Robots,” but the crowd was breathless for the Dark Side set. Flaming Lips’ ‘Dark Side,’ Conan O’Brien, Kings of Leon bring rock to Bonnaroo Day Two, hitfix.com, June 12, 2010: “The Lips had the added benefit of Death Star and White Dwarfs as they all worked in tandem to recreate the classic Pink Floyd album, and for the most part, they did it in stripes (and smoke). Everyone was positively swimming in “The Great Gig in the Sky,” and “Money” was played slow and grimey. Side two, after that, started getting blurry, “Brain Damaged,” if you will, and the final bows were followed by the house music: “What a Wonderful World,” Louis Armstrong. The Flaming Lips prepare ‘Dark Side of the Moon’ for late-night Bonnaroo set, USA Today, June 11, 2010, 7:54 PM: “The Flaming Lips’ late-night sets have become something of a Bonnaroo institution — colorful musical experiences full of whimsy and psychedelia. The Lips have played Bonnaroo two times before — in 2003 and 2007. They’ll do their longest Bonnaroo show yet in Saturday’s pre-dawn hours, playing their regular set, then performing Pink Floyd’s Dark Side of the Moon in its entirety. 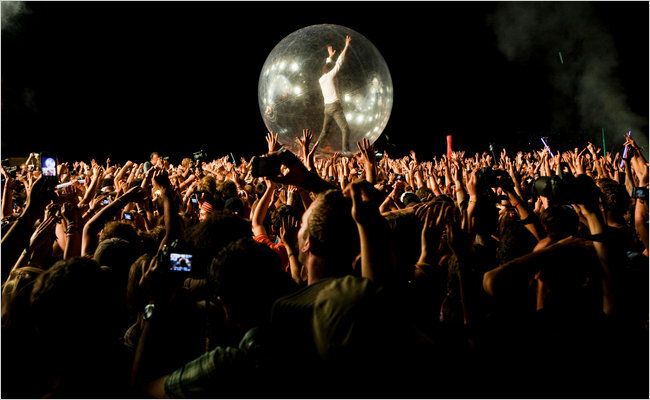 For Lips frontman Wayne Coyne, it’s about giving the audience an unforgettable experience. Wayne says some of the Dark Side songs didn’t get much of a reworking. The Flaming Lips have performed the album live only once before, at a New Year’s show in Oklahoma City. “When you play to a crowd on New Year’s Eve, by the time you’re playing at 2 o’clock in the morning, they’re kind of zonked out and up for anything,” Wayne says. “A lot of people know the songs, but they don’t know every word, so it’s a little bit forgiving. Bonnaroo 2010: Flaming Lips Play Pink Floyd, Wall Street Journal, June 11, 2010, 6:00 PM ET: “From Steely Dan to Suicide, countless music acts have performed popular albums from their catalog live, beginning to end. In a twist on that concert trend du jour, the Flaming Lips will be playing someone else’s album—Pink Floyd’s “Dark Side of the Moon”—tonight at midnight, when they’re scheduled to take the stage at Bonnaroo. Led by singer Wayne Coyne, the Oklahoma psych-rock group teamed up with Stardeath and White Dwarfs, a group that includes Coyne’s nephew, to record their version of the stoner classic in a couple days. Speakeasy spoke with Coyne about the project. The festival is also using its location to bring in some country music. These include Miranda Lambert, Jamey Johnson, Hot Rize, the Punch Brothers, and the Nitty Gritty Dirt Band. Steve Martin will also join the lineup for Friday evening. http://ireport.cnn.com/ir-topic-stories.jspa?topicId=456408, ireport.cnn, June 9, 2010: CNN.com is sitting down with some of the hottest names in music at the Bonnaroo 2010 music festival this weekend, and you’re invited to be a part of our coverage. Skateboarding to Bonnaroo, WRCBtv.com, May 31, 2010 3:51 PM EDT: “One Florida man is making his way to the annual Bonnaroo Festival on an unusual set of wheels. Dale Louttit is making the trip on his skateboard. He started the nearly 750 mile trip in Punta Gorda, Florida. The 45-year-old Floridian says he’s carrying around 60 pounds of equipment. Luttit says he plans to make it over Monteagle by the end of the day. “I’m gonna do something that nobody can take away from me, and this is it. But there is actually one person who can take this away from me and that’s myself with the decisions I make on my journey,” says Louttit.